If one or more of your coronary arteries (the vessels that carry blood to your heart muscle) are blocked, blood can’t flow to the heart muscle. In this case, the heart muscle may die (heart attack). Coronary artery bypass surgery creates a path for blood to flow around a blockage and helps prevent a heart attack. The saphenous vein, which is located in the leg. The radial artery, which is located in the arm. The internal thoracic (mammary) artery, which is located in the chest wall. While one member of the bypass team is getting the graft, another member works to reach your heart. First, an incision is made in the chest. Then the breastbone (sternum) is pulled apart. The breastbone is held open throughout surgery. This puts pressure on the nerves of the chest. This is why you may have soreness and muscle spasms in your chest, shoulders, and back during recovery. A small opening is made in the coronary artery, below the blockage. If a saphenous vein or radial artery is used, one end of the graft is sewn onto this opening. The other end is sewn onto the aorta. If the internal thoracic (mammary) artery is used, one end of the graft is sewn onto this opening. The other end is already attached to a branch of the aorta. Once the graft has been attached, blood will start flowing through this new pathway to bypass the blockage. If you have multiple blockages, more than one bypass may be done. Then your breastbone is rejoined with wires. These wires will stay in your chest permanently. The incision is closed, and you are taken to the intensive care unit to begin your recovery. Coronary artery bypass surgery can be done with the heart still beating (off pump) or with the heart still (on pump.) Your surgery team can tell you more about which type of procedure you will have. On-pump procedure: A machine does the work of your heart and lungs during surgery. Blood is circulated through a heart-lung machine. The machine supplies the blood with oxygen and pumps it back through the body. 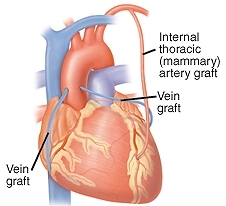 In these cases, the heart may be stopped temporarily before the graft is attached. Your own heart and lungs start working again after the bypass is completed. Off-pump procedure: The heart-lung machine is not used and the heart is not stopped. This is sometimes called a “beating heart” procedure.